We offer high quality aluminium bifold doors throughout cornwall. They can be purchased on a supply only basis or we offer a start to finish fitting service. Aluminium folding doors are perfect to maximise space due to the unique opening mechanisms. They're also extremely durable and contemporary in finish, coming in a variety of different RAL colours, so you can tailor the look to your home. Bi-Fold doors create the perfect opening between your home and garden. Lightweight, low profile, and robust, our Aluminium Bi-fold doors are designed to allow as much light as possible to fill your home. Aluminium bi-fold doors provide a practical, secure and durable solution to making the most of your inside and outside space. The main advantage of bi-fold doors over slide patio doors is that when opened up, they sit flush to the wall, opening up the space to a far greater extent than is achievable with the more traditional sliding door. At All Glass we know that every home and every project is unique. If you have any questions about any of our products, or would like to talk with one of the All Glass team about the most suitable options for your home please do give us a call. Visofold aluminium bi-fold doors can be used in domestic applications as either an alternative to aluminium sliding doors, or to open up an entire wall as part of a conservatory; the aluminium bi-fold door system will make the most of a beautiful view or bring a garden into the home. 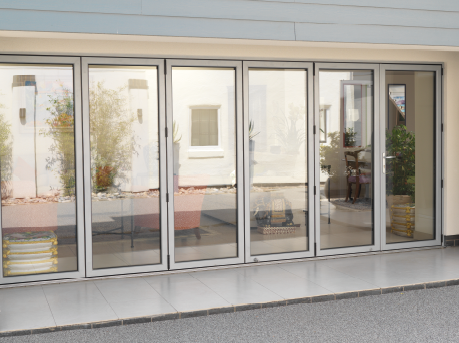 Particularly in Cornwall the weather conditions we face are particularly tough on frames, which is why aluminium bi-fold doors with their power coated finishes are suited to the coastal environment. Visofold aluminium bi-fold doors offer a choice of opening configurations to suit any application. Choose to fold the sashes internally or externally, place the opening at the side so the sashes all fold one way, at one end, to create a single entrance door for easy access, or in the middle to give the option of a double door. All Visofold bi-fold door profiles feature a polyamide thermal break that enhances the thermal performance of the profile and improves the overall U-Value. 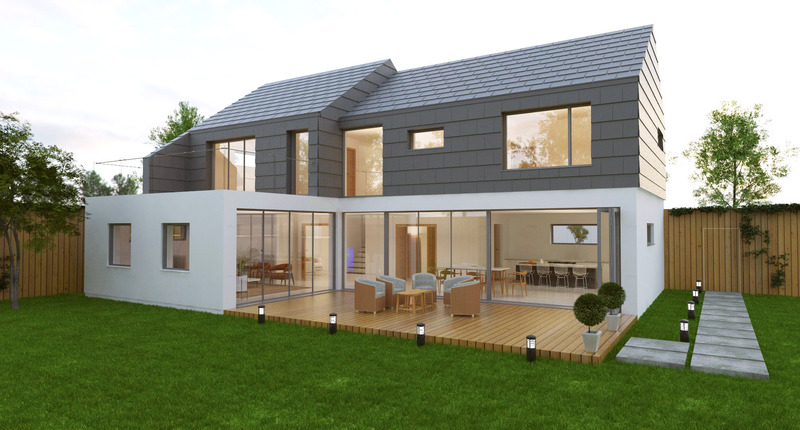 Profiles feature EPDM high quality gaskets and weather brushes to aid weather resistance. 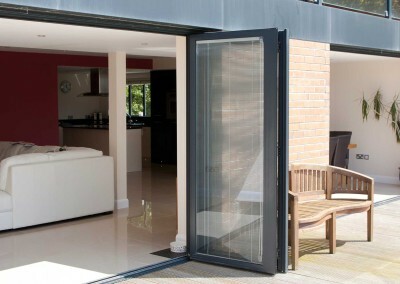 Smart systems aluminium bi-fold doors comply with the requirements of Building Regulations Document L 2010. The Visofold series of folding doors offer impressive opening apertures that can join internal and external areas creating unique living and social areas. Suitable for both residential and commercial applications. Stock aluminium folding doors available on a 10 day lead time, includes delivery throughout Cornwall.